Well as announced I went into Williams Lake for groceries yesterday. After six hours of driving and over an hour to find the recycling place I got back late, which resulted in a long nap this afternoon. So here is today’s blog quite late in the day. We find ourselves about half way through the season today as well so I will have to throw some stats at you. Although it never really felt busy today, we actually set a new season record for most birds banded at 44 (up from 40 which we have had twice this season). This despite Avery allowing two birds to free themselves before he could get to them on his last net run, one of which would have been our first White-throated Sparrow of the year. Busy days are always best when the flow of birds is constant and that was certainly what we had today as no one net run was that big, and when we set a new record I was surprised because it had felt like a slow day. This helps us avoid stress on the birds and on ourselves as the last thing we want is an avoidable injury. Perhaps it also felt slow, because there were few birds to be seen, emphasized by a very mediocre census that finished in record time because there was nothing to look at. Low detection of birds was no doubt caused by the light rain we had most of the day, and resulting in only a short period of time that the station did not have two banders. The banding highlight of the day was definitely our first Olive-sided Flycatcher of the year (and just the sixth ever), though we were also surprised to catch three Hammond’s Flycatchers after having caught very few empidonax flycatchers in the last week. The only species of note on census was a Western Wood-pewee that was actually calling near the lagoon. Apparently today was a good day for flycatchers. Well if you’re still reading don’t say I didn’t warn you about impending stats. Something to keep in mind is that in the last five years we have averaged 1779 total birds banded, this year we are running a projected total of just 1359. This is good news though as just two weeks ago our projected total was less than 1000. 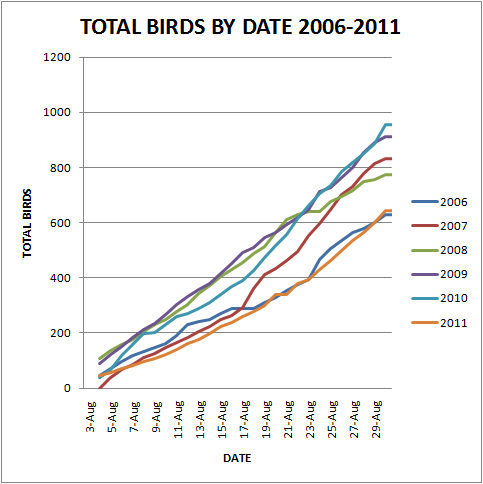 To see which species are causing this trend I provide you this table. Not nearly as bad as the last time I presented this information, but you can definitely see that Common Yellowthroats, Warbling Vireos, and Orange-crowned Warblers are down, while Yellow Warblers and American Redstarts are up. If you were curious as to the numbers of each species we have caught this year then worry not! For here are the answers, so long as you speak bird code. As you can see Yellow Warblers, American Redstarts, and Swainson’s Thrushes are leading the charge, but of late Warbling Vireos and Lincoln’s Sparrows are making a race of it. A race they will likely ultimately win. Now if you were wondering how our twelve nets were performing (as I know you all are), wonder no more. Avery’s net 18 has now been passed by perennial favourite net 17 for the lead, while those two combined almost outperform the other ten nets. But now you’re no doubt wondering who is doing all the work at the station. Well here are the stats on that. At the moment I have done a couple birds more than Avery, but if there were a plot over time you would see me take a quick lead on him at the start of the season and then see him creep up slowly until he passed me this morning while I was on census. At this point he graciously let me band most of the birds after my return in order to save face. Though he did ‘accidentally’ erase about 30 records a couple days ago after a large net run. This meant I spent the next ~15 minutes recovering the lost data while he banded about 12 birds in a row. There I think that will be all the stats I throw at you for now. Stay tuned for the end of the next month when I throw even more at you. We recently completed our annual June walk through the fields and forests in our properties in the Tatlayoko Valley. We do this each year to record birds either seen or heard along the way. 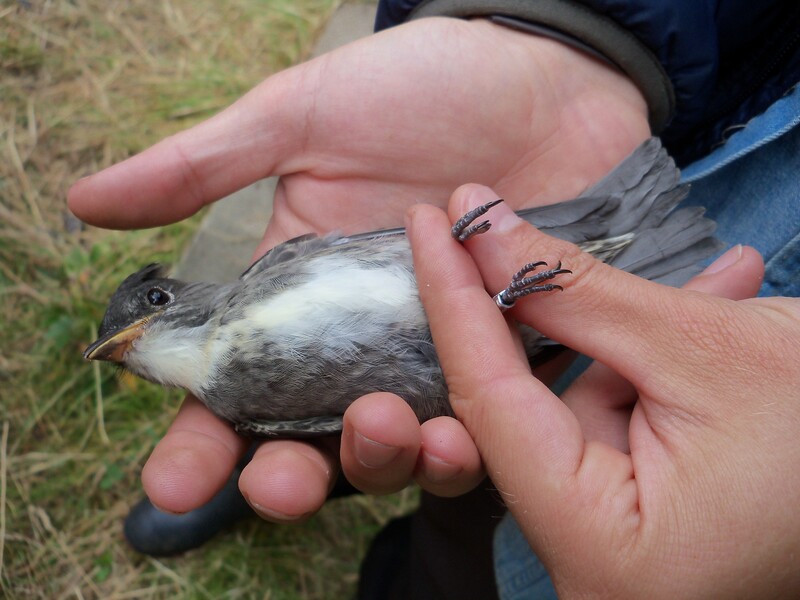 In particular we track breeding bird populations, as this is a key way we can judge how well our conservation properties are protecting local biodiversity. Two of the many fascinating birds we encountered are Wilson’s Phalarope and Lazuli Bunting. You can read more about them on NCC’s website.